Formula One, abbreviated to F1, is the highest class of open-wheeled auto racing defined by the Fédération Internationale de l'Automobile (FIA), motorsport's world governing body. The "formula" in the name refers to a set of rules to which all participants and cars must conform. The F1 world championship season consists of a series of races, known as Grands Prix, held usually on purpose-built circuits, and in a few cases on closed city streets. The most famous Grand Prix is the Monaco Grand Prix in Monte Carlo. Each winner is presented with a trophy and the results of each race are combined to determine two annual Championships, one for drivers and one for constructors. The World Championship for Drivers is held since 1950, after the Formula One standard was agreed upon in 1946. The Constructors' Championship was added for the 1958 season and has been awarded ever since. Michael Schumacher won a record 91 Grands Prix during his career. He won 19 races with Benetton and 72 with Ferrari. Michael Schumacher holds the record for the most Grand Prix victories, having won 91 times. Lewis Hamilton is second with 75 wins and Sebastian Vettel is third with 52 wins. Kimi Räikkönen holds the distinction of having the longest time between his first win and his last. He won his first Grand Prix in 2003 at the Malaysian Grand Prix, and his last (to date) in 2018 at the United States Grand Prix, a span of 15 years and 212 days. Riccardo Patrese holds the record for the longest period of time between two race wins–more than six-and-a-half years between the 1983 South African Grand Prix and the 1990 San Marino Grand Prix. Mario Andretti had to wait the longest time between his maiden victory at the 1971 South African Grand Prix and his second win–coming five years, seven months and 18 days later at the 1976 Japanese Grand Prix. Sebastian Vettel holds the record for the most consecutive wins, having won nine Grands Prix in a row from the 2013 Belgian Grand Prix to the 2013 Brazilian Grand Prix. Max Verstappen is the youngest winner of a Grand Prix; he was 18 years and 227 days old when he won the 2016 Spanish Grand Prix. Luigi Fagioli is the oldest winner of a Formula One Grand Prix; he was 53 years and 22 days old when he won the 1951 French Grand Prix. As of the 2019 Chinese Grand Prix, out of the 764 drivers who started a Grand Prix, there have been 107 different Formula One Grand Prix winners. The first Grand Prix winner was Giuseppe Farina at the 1950 British Grand Prix, and the most recent driver to score their first Grand Prix win was Valtteri Bottas. This list includes the winners of the Indianapolis 500 race between 1950 and 1960, as they formed part of the World Championships, even though they were not run by Formula One regulations, nor are they referred to as Grands Prix. Lewis Hamilton has raced for McLaren and Mercedes. He has won 21 races with McLaren and 54 with Mercedes. Sebastian Vettel currently has four consecutive titles to his name, winning them all with Red Bull Racing. 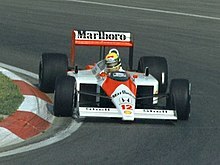 Ayrton Senna won the Canadian Grand Prix in 1988. Diepraam, Mattijs (24 June 2012). "World Championship Grand Prix Wins". Forix. Autosport. Retrieved 8 July 2012. ^ "About FIA". Fédération Internationale de l'Automobile (FIA). Archived from the original on 28 June 2011. Retrieved 31 October 2008. ^ "His Serene Highness Prince Rainier of Monte Carlo awarded the first FIA Gold Medal for Motor Sport". Fédération Internationale de l'Automobile (FIA). 14 October 2004. Archived from the original on 15 November 2007. Retrieved 30 October 2008. ^ a b Williamson, Martin. "A brief history of Formula One". ESPN. Archived from the original on 4 January 2018. Retrieved 4 January 2018. ^ "Timeline of Formula One". ESPN. Archived from the original on 4 January 2018. Retrieved 4 January 2018. ^ "Superb Schumacher signs off in style". BBC Sport. 22 October 2006. Retrieved 31 October 2008. ^ "I've proved people wrong, says Raikkonen after stunning Austin win". formula1.com. 21 October 2018. Retrieved 21 October 2018. ^ "Wins: Interval between two". statsf1.com. Retrieved 3 January 2018. ^ Leslie, Jack (18 August 2017). "The 5 Drivers with the Biggest Gap between First and Second F1 Wins". wtf1.com. Retrieved 3 January 2018. ^ Ostlere, Lawrence (15 May 2016). "F1: Max Verstappen wins Spanish GP after Lewis Hamilton and Nico Rosberg crash – live!". the Guardian. Retrieved 15 May 2016. ^ Lynch, Steven (3 February 2012). "Over forty but still fast". ESPN. Retrieved 18 June 2012. ^ "Grands Prix chronology". Stats F1. Retrieved 16 October 2014. ^ "Wins chronology". Stats F1. Retrieved 6 March 2012. ^ "Sochi stats – Bottas becomes F1's 107th different winner". formula1.com. 30 April 2017. Retrieved 2 May 2017. ^ "Monaco and Indianapolis: a Crown worn just by two". FIA. 29 May 2016. Archived from the original on 4 January 2018. Retrieved 4 January 2018. ^ Thorn, Dan (5 January 2017). "8 Reasons Why F1 Was Weird in the 1950s". wtf1.com. Archived from the original on 4 January 2018. Retrieved 4 January 2018.